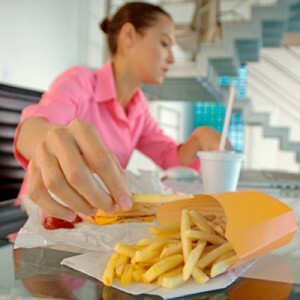 Natural Health News — Highly stressed people who eat a lot of high-fat, high-sugar food are more prone to health risks than low-stress people who eat the same amount of unhealthy food, according to new research. For the study, published online in the journal Psychoneuroendocrinology, researchers from the University of California at San Francisco (UCSF) spent a year studying a group of 61 healthy women; 33 were chronically stressed women caring for a spouse or parent with dementia, and 28 were women with low stress. The women also reported their consumption of high sugar, high fat foods. The researchers evaluated key biological markers associated with elevated metabolic risk including waistline measurements, assessments of abdominal fat deposits. They also tested participants’ insulin resistance – a key driver of metabolic syndrome – and used blood tests to measure levels of hormones and a blood test to measure stress hormones and oxidative (free radical) damage to lipids and cell RNA, a marker that has predicted higher rates of death from diabetes. Oxidative damage of the genome is also an important outcome because it is one factor that can contribute to faster cellular ageing. “Diet appears to be a critical variable that can either amplify or protect against the metabolic effects of stress,” said senior author Elissa Epel, ” but we still don’t know the details of how much it takes.” Their next study, she says, will specifically feed high stress people a consistently high sugar diet and monitor its effects.